Such a few people have the innate or acquired essence to grow and overcome themselves in adverse episodes of existence. Even there’re less people qualified to take over the historic torch of leadership of a country and make it move towards a future dream. The U.S. Presidents Clinton and Obama, the Brazilian ones like Lula and Dilma, or the paradigmatic case of Nelson Mandela are some honourable exceptions. But it seems that slowly the flame is being turned off. We, the new generations, feel increasingly, more orphaned of political leadership. We can not avoid looking back and fix the gaze on the Kennedy family to find an inspiring leadership. I do not intend here to do a reverential praise to the Kennedy family but I’d like to highlight the relevant values and family circumstances that make this a special group and example to follow in the context we are referred about. If we can come closer the zoom to exemplify the family paradigm, not the eternal presidential figure in JFK, but the personality and character of the immediately smaller brother, RFK is the key figure without the JFK’s mystic hadn’t occurred. - The Irish-Catholic family origin make the hole members of the family “personae non grata” and were often rejected in most social, cultural and educational circles of the time. The political life of the Kennedy family has always been linked to the social stigma of being accused of serving as the “candidates of the Vatican.” It is fair to say that the religious origin of the family sounds very familiar to the skin colour or the gender debate of a particular presidential candidates since 2006 (Do you remember the rhetorical question: ”Is America ready to elect a black or a woman president?”). RFK always sympathized with Jew, Communist and Black friends, also has a preference on emancipation and liberation social and political movements; usually he understood all those minority groups with voices gagged. The reflexion mirror effect of was omnipresent in his entire life. - The financial welfare life of the family “made” appear all the members, in the eyes of others, far away from the common everyday life of most of his friends. This fact made at an early age, that all family members, participate actively in associations and charities for social assistance to those most vulnerable and fragile members and families of their society. - Another constant of the family values was the mandatory experience to leave home and travel around the world and know the multiple realities and complexities of the societies, its organization on different communities and its relationship with its people. Europe, Latin America and the Asia-Pacific areas were familiar to all Kennedy family members. Therefore we can easily conclude that in RFK’s life, he faced a permanent struggle: one internal and anther one external. The latter made him grow an absolute and ruthless instinct to protect his own people. This is key to the understand the hole Robert’s political character. Few political figures have the experience of living in the first person the fact of being behind and in front of the public scrutiny and public opinion spotlight in such a short period of time. Anything the President could not politically affirm or enact, the brother executed it without blinking. For example: the difficulties on building the trust relationship between Martin Luther King Jr. and the Kennedys took a long time and a lot of efforts. The Kennedys defended the “black cause”, but could not stop dragging the tempo of the Civil Rights organisation. JFK and RFK offered protection to the Southern activists, they freed the prisoners and they guaranteed the security of the black people going to the forbidden Colleges and Universities. - Substantial presence in all districts and states, especially those ones that were not favourable to the Kennedys and where the opponents felt they were saved and home. They’d make hear their voice without apologizing for being there, employing all existing resources and inventing new ones to combat the majority opinion that identified the Kennedys as the “Pope altar boys at the White House”. 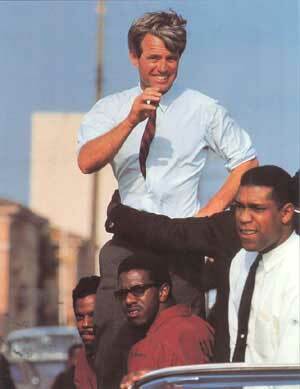 RFK’s campaigns were the first to professionalize Public Relations on elections. - Issues: They took and raised the flag against American Poverty. Their campaigns were about those people forgotten and excluded, victims of social injustice. They knew they were privileged to be part of a wealthy family. They were committed to the most vulnerable members of society, it was like an ethical and moral “commandment”. They gave up their public salary. - They assumed even with they own education, training and travel around the world, they did not know everything. They surrounded themselves with the more talented, experienced and privileged voices of the professional and academic areas: Historians, Economists, Lawyers, Diplomats, Teachers, Doctors, Scientists and Researchers, Intellectual and Cultural figures of Europe and abroad … gathered the talent, knowledge and creativity of the bests experts to be well prepared and try to anticipate future challenges if they had the chance to Govern the country. - Related to the above stated: the inner circle of the campaign, the candidate, the President, the counsellors, their trust-teams would be joined, not for those voices who sung their excellence and laugh their jokes, but those who put in poor evidence the limitation of their arguments and those who could help make them invincible. - An election campaign requires courage, not wobbly legs and especially military discipline: the tandem brothers army vital experience was present in every election time and in every political decision. These are some of the basic pillars, financial situation and parental influence a part, that explains the grand coalition building of wills that was able to cope with the establishment voices who controlled the designs and wishes of the Democratic Party, who saw the Kennedys as a serious threat and menace to their interests. While cheating on both sides of the race, finally Kennedy won the necessary delegations votes of the convention and got the presidential nomination in 1960. Never before had any senator, in his first term, achieved an accomplishment of this magnitude. That night the two brothers stared each other under the watchful eye of their Father, and looked with the respective caracteristic smile. They had won a battle, but not the war. - Transition: the daily National Security briefings, with special attention to the Communist block, the situation in Cuba and Indochina; as well as the appointment of key posts into the new administration where RFK was always the last key filter and the approval to all sites was under his responsibility in the strategic and political perspective. The cabinet had explicitly with his Ok.
- His father advised the President-elect about the difficult crisis to come and the need to have someone of his blood, close and top confidant to deal with the CIA, the FBI, the “hawks” of the DoD, State Department and even the Military Joint Chiefs. The failed invasion of Cuba orchestrated by the CIA and the Cuban Missile Crisis (1962) are examples that would be well known. RFK would be appointed Attorney General, the equivalent figure midway between the Minister of Justice and Attorney General of the Spanish system; and would always be invited to meetings of the permanent NSC (National Security Council). - RFK also was responsible with the relationship with the FBI, led by an avowed enemy of the Kennedy family: J. Edgar Hoover who had suspected about all the civil rights movement, who has been permissive with the KKK and even wire-taped Government buildings of the Kennedy administration. - RFK was a ubiquitous voice in foreign policy and foreign relations with the Soviet bloc (Berlin Crisis of 1961, Indochina …) and had fluid and frank liaisons with Russian top leaders as Krushev and Gromiko, among other Communist representatives. RFK handle in person the very crisis moments of greatest tension and was the unofficial voice of the President during this crisis. - RFK led investigations about corruption and illegal activities of abuse of Unions (Teamsters) and the Mafia (Hoffa). This period certify his reputation for blunt, relentless and working until exhaustion character. Some have argued that in this episode, RFK played very skillfully to distance himself from his past collaboration with the team of Senator McCarthy and his particular “witch hunt” of suspected “Communists”. - The unstoppable movement of Civil Rights and the system of segregation led by Martin Luther King Jr. was the most sensitive issue for the American public of the time. The RFK office was the safe and direct conduit between the Pastor and the White House. Understanding and breaking points to the abyss were the usual elements that made based and enforce the relationship with more similarities than differences. It was RFK who released from prison Civil Rights activists, protected them and even guarding their integrity and security in Colleges and Universities. Robert Kennedy speeches like the JFKs ones are tailored by a very similar pattern, bright oratory, closeness and feelings; always looking for unity against the social division, always trusting in the future and overcome the challenges and obstacles; they share very common language resources. The hand of Ted Sorensen (I’m sure right now he’s in the sky writing the bests speeches ever!) was masterful and very long. These speeches are a vital source of consultation for any person who engages the world of speech-writing. After the Dallas tragedy (November 1963) Robert Kennedy stands and takes the moral leadership of the family, and seems to retreat to “winter headquarters” speaking with great dignity at all times of the “pain and the need to close wounds and scars of America”. While emphasizing that their ideological positions with the-now-President Johnson, nine months after Dallas, he left the administration distancing himself from the above policy regarding the fight against poverty, civil rights and foreign policy: with the Vietnam War as a great backdrop. In this precise moment the ideologue, brain, strategy, the “bodyguard” of the President mode character, the loyal person par excellence, the wedge needed for the Pentagon, the Secret Service and the State Department turned the presidency Kennedy a puppet; and appears on the scene another RFK unknown until then: the leader, the candidate is back in top form, the main character, who takes over the historical and ideological martyr President, which he is liable co-author from the beginning. First he fights for the New York Senate races and then tries the Democratic presidential nomination for the 1968. Robert Kennedy continued the awaking programmatic, policy and ideology of his brother: focusing on the fight against exclusion and poverty is his winning bet. Different primary elections changed the perspective from certain defeat to win the nomination. President JFK was murdered, but people had not forgotten his dreams… Until the tragedy returned to the heart of the family, this time at the Ambassador Hotel. Is it curious how history has treated the Kennedys one of the greatest families. President Obama knows this and proudly proclaims himself as a Kennedy heir. 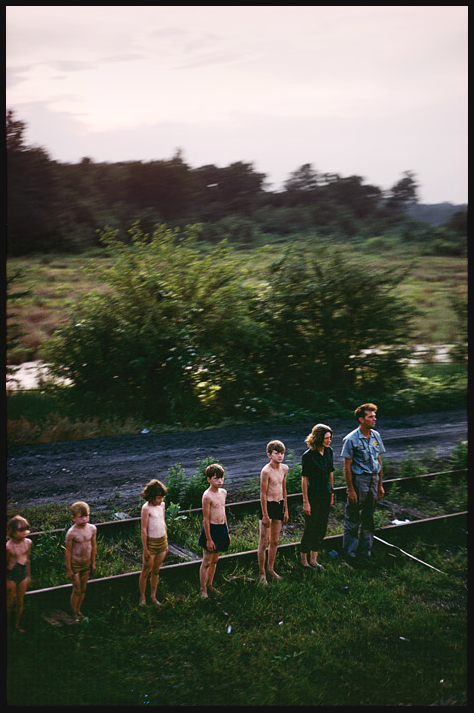 Finally, a picture that is worth than a thousand words: on the railway route in RFK’s body moved from California to New York, anonymous people approached the stations where the train stopped-by, for simple curiosity or to pay a personal tribute to the figure killed. The power of this picture can not be explained in words: the heartfelt and solemn tribute to this “forgotten and excluded” family members to mourn the loss of one of the most signified poverty, social exclusion fighter: who embraced the most denigrated, enslaved and poor in America, bringing hope for a better tomorrow for themselves and their children. After decades we are still looking for ready and courageous leadership, which like the Kennedy family, believe in a better future for our people and nations. We haven’t find it yet, but we do not give up. We know that it is hard and increasingly difficult but we hope and work to find them. Una familia increible! Jamás olvidaré el momento en que, con ocho años , me entero de la triste noticia del asesinato de JFK. Acababa de volver de mi escuela, merendé y salí a mirar los trabajos del asfaltado, por demás novedoso, de la calle “25 de diciembre” (hoy “Ygatimí”), a una cuadra de mi casa en Sajonia. Me dolió y también me impresionó la rapidéz con la aparece una canción de un grupo Mejicano que decía “… Estados Unidos tendrá Presidente, pero como Kennedy ya no encontrarán…”, que creo haberlo escuchado al día siguiente de aquella triste tarde y que permanecerá en mi memoria para siempre!